Pick up at Srinagar Air Port ,Transfer in Hotel, After fresh and Visit to famous Mughal Gardens Chashma Shahi, Nishat - Overnight at House Boat. After breakfast drive Srinagar to Kargil (235Kms).Via Sonamarg, Zojila pass,Drass (Second coldest place In the world) and view Tolo ling where Indian army sacrifies during Kargil war. On arrival transfer to Hotel. Post breakfast we drive to Uleytokpo / Tingmosgang enroute visiting Lamayuru, Belongs to Dripung Kagyu (Red Hat) like Phyang. The oldest structure in Lamayuru is the Singey Lhakhang built by the founder of Alchi Lotsava Rinchen bzangpo in 11th century. After visiting Lamayuru we proceed further to Uleytokpo enrote visiting Ridzong Gompa, known as the paradise for Meditation. Upon arrival in Uleytokpo or Tingmosgang. We check in at our Camp for overnight Stay. Post Breakfast we proceed for Indus Valley Monastery tour including SHEY PALACE, SINDHU GHAT & STOK PALACE. Dinner & Overnight at the Hotel. DAY 06: LEH.NUBRA VALLEY VIA KHARDUNG LA 18,390 FT. (120 KMS / 4 ). Post breakfast we drive to Nubra Valley. The road journey from Leh to Nubra Valley passes over KHARDUNG LA (THE HIGHEST MOTORABLE ROAD IN THE WORLD) AT 5,602 M / 18,390 FT. 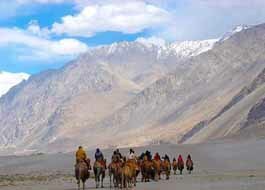 Upon arrival in Nubra we check in at our Camp / Hotel in Hunder for Overnight stay. In the evening you can walk around the tiny villages to see how the locals live in this part of the world. A visit to a Ladakhi home can be arranged. Dinner and overnight at the Camp. After an early breakfast we check out from the Camp and drive to HUNDER where you have opportunity to ride on a bacterian camel (double humped) amidst the sand dunes of this high altitude desert with snow capped mountains on the horizon. Between we drive back to Leh in the late afternoon via Khardungla Top. On arrival at Leh you will check in to your Hotel. After an early breakfast we leave for PANGONG LAKE en rooted visiting SHEY PALACE,After the success of 3 Idiots, this beautiful natural location has attracted more tourists from all over the world. evening back & Overnight at the Hotel. 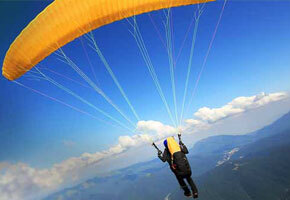 Drop at Airport to catch the Flight for your onward Destination end the Tour With Jagdamba Holiday.